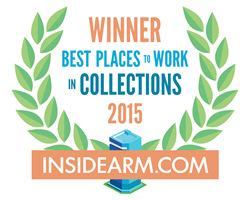 Fresh View Solutions, the collections agency of SquareTwo Financial, a leader in the $100 billion asset recovery and management industry, has been named one of the top 10 Best Places to Work in Collections for mid-sized companies (50-149 employees) by insideARM. Employees of Fresh View Solutions are provided with personal time off, two floating holidays, health insurance with 100% coverage, 401(k) plan, employee wellness programs, on-site fitness center, on-site health screenings, free RTD EcoPass, employee assistance programs, career certificates reimbursement, elder care services, short-and long-term disability, free parking, and domestic partner/spousal equivalent benefits. Now it its eighth year, Best Places to Work in Collections identifies, recognizes and honors the best places of employment in the collections industry. As a whole, the industry benefits the nation’s economy and its workforce by recovering more than $55 billion owed to businesses and providing more than 230,000 jobs. The industry’s employees pay nearly $2 billion in local, state, and federal taxes, contribute over $130 million to charities, and spend over 2 million hours volunteering their time annually (source: ACA International/Ernst & Young 2014 Impact study). Companies from across the U.S. entered the two-part survey process to determine the Best Places to Work in Collections. The first part consisted of evaluating each nominated company's workplace policies, practices, philosophy, systems and demographics. The second part consisted of an employee survey to measure the employee experience. Read more about the award rankings [here. SquareTwo Financial is a leader in the $100 billion asset recovery and management industry. Since 1994, the company and its subsidiaries have helped more than two million individuals and businesses resolve their outstanding financial obligations. SquareTwo Financial’s collection agency, Fresh View Solutions, works with consumers to repay their financial obligations. The company’s Fresh View Funding debt ownership team works with banks and other issuers of credit to purchase unpaid debt. SquareTwo Financial is based in Denver, Colorado. Visit http://www.squaretwofinancial.com for more information.